Porcelain Fused to Metal restorations are Porcelain fired under vacum to non-precious, semi-precious, white or yellow high noble alloy. Proper tooth morphology and emergence profile at the margins facilitate excellent tissue compatibility. Stewart Dental Lab uses a solid model to verify proximal contacts, ensuring your restorations seat with little or no adjustments. 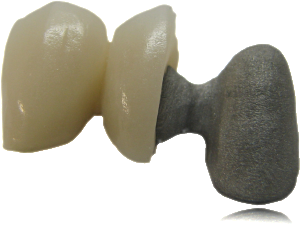 All Porcelain Fused to Metal dental restorations are casted with metal from the Argen corporation.